The first source of contamination, both particulate and microbial in any cleanroom is the operator. Contamination must be prevented through the use of protective clothing. 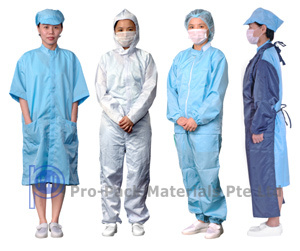 Our protective clothing are made of cleanroom fabric with antistatic thread woven into it. The clothing protects residual static charges that accumulate on personnel which cannot be removed from normal grounding devices. Rated static dissipative per DOD HDBK-263, these lightweight, breathable garments are washable and durable. At Pro-Pack Garment Facility, we have Various ESD Materials and Colours that our customers can choose from. Our in house designers works with our customer to deliver design that is according to customer coperate requirement. Coupled with our trained and experienced production team will ensure that our cleanroom garments meet the highest standards of workmanship and quality.